setup.exe /Q /IACCEPTSQLSERVERLICENSETERMS /ACTION=installfailovercluster /INSTANCENAME=SUNGRD /INDICATEPROGRESS /UPDATESOURCE=C:\Installers /FEATURES=SQL,IS,RS,AS /SQLSVCACCOUNT="OMATECH\sqlserverkampala" /SQLSVCPASSWORD="********" /SQLSYSADMINACCOUNTS="OMATECH\MSSQLDBAdmins" /AGTSVCACCOUNT="OMATECH\sqlagentkampala" /AGTSVCPASSWORD="********" /FAILOVERCLUSTERNETWORKNAME="SVR-AVAYA-SQL" /FAILOVERCLUSTERDISKS="INST5_SysDB_Data_01" "Inst5_SysDB_Log" "INST5_AVAYA_Data_01" "INST5_AVAYA_Log" /FAILOVERCLUSTERIPADDRESSES="IPv4;175.20.1.7;Public;255.255.255.0" /FAILOVERCLUSTERGROUP="SQL Server (AVAYA)" /SQLBACKUPDIR=L:\INST5_AVAYA_LOG\BACKUP /RSSVCACCOUNT="OMATECH\sqlserverssrs" /RSSVCPASSWORD="********" /INSTALLSQLDATADIR=K:\INST5_SYSDB_DATA_01\DATA /SQLUSERDBDIR=K:\INST5_AVAYA_DATA_01\DATA /SQLUSERDBLOGDIR=L:\INST5_AVAYA_LOG\LOG /SQLTEMPDBDIR=K:\INST5_SYSDB_DATA_01\TEMP /SQLTEMPDBLOGDIR=L:\INST5_SYSDB_LOG\LOG /ASSVCACCOUNT="OMATECH\sqlserverssas" /ASSVCPASSWORD="********" /ASSYSADMINACCOUNTS="OMATECH\MSSQLDBAdmins" /ASCONFIGDIR=K:\INST5_SYSDB_DATA_01\SSAS /INDICATEPROGRESS /ASDATADIR=K:\INST5_AVAYA_DATA_01\DATA /ASLOGDIR=L:\INST5_AVAYA_LOG\LOG /ASTEMPDIR=K:\INST5_SYSDB_DATA_01\TEMP /ASBACKUPDIR=L:\INST5_AVAYA_LOG\BACKUP /ISSVCACCOUNT="OMATECH\sqlssisbigdata" /ISSVCPASSWORD="********"
This was not the first installation of this nature and in this manner we have done but in this case, we found that quite close to the end of the installation we noticed the Analysis Services component did not start on the and the installation failed effectively. Unable to read parameters from registry for Service '(null)'. Error: 13, property in error is 'ServiceName'. The service cannot be started: File system error: The following error occurred during a file operation: Access is denied. . (\\?\K:\INST5_AVAYA_DATA_01\DATA\CryptKey.bin). We were able to solve this by granting full control of the parent folder for this file Cryptkey.bin to the account NT SERVICE\MSOLAP$<Instance_Name>. As at now we do not knw whey the permissions were not automatically granted but once we retried the started on the installer (an option we had because we resorted to GUI), the installation completed successfully. A Senior Officer at Ekiti State NYSC encouraging me to climb a mango tree to get mangoes for my female colleagues. To me that was ancient wisdom on how to really win a woman’s heart and what it means to be a man not just a male. It struck me more because I often perceived him as one who was always joking yet there was this hidden wisdom in him. Mr. Ibraheem Salau back when we worked together at Airtel Nigeria. I was particularly struck by this because some Christians do not have this firm position about telling the truth especially in the workplace when their jobs of professional reputations are at stake. It was a challenge to me as a Christian. My Mum after I had failed to deliver a sermon in church as expected even though everyone else clapped. Only those who know you well ans really love you will tell you the truth. Sycophants are always clapping for you up to when you fall flat on your face. True friends who love you can tell you your flaws to you face even at the risk of losing you. Rev. Alan Okumeng Mensa when I asked his counsel on an elderly person whom I perceived to be bothering me with incessant requests for assistance. Some burdens are heavy but necessary and they are the true test of our claims of godliness. Hope you read something striking! Feel free to share statements from people around you that have stuck with you over the years. It’s 2018 and I should start by saying “Happy New Year and thanks for stopping by”. One of the things we are pursuing this year is the penetration of our new book Entangled in the ever-so-competitive world of literature. We worked very hard on pre-sales publicity starting October 2017 and we did get some support thanks to VentSell and Wigal (our USSD Code Provider). It is really fun to use technology to do something seemingly ordinary. During the launch we took it a step further and streamed online, allowing friends to share in our effort and equally be inspired to pursue their own gifts. I really enjoyed the Book Launch and we really didn’t have to spend so much. Ever so grateful we are to friends who helped out. It is simply an awesome thing to have people around you who give their time and talents to assist one pursue their dreams. Whatever you do, find great friends. Social Media? Amazing. Chris Greenwood taught me a cool way to grow Facebook audience which worked in an amazing manner. It help reach uncharted regions. In the course of this publicity we also got to meet good supporters right here in Ghana. Even out YouTube Channel has seen significant growth since the launch of Entangled. Challenges? Yup, we had them. From printing errors to illness to technical flaws with our streaming, challenges are part of our journey to greatness. It is all part f the story. Whatever you are pursing on this planet, expect difficulty. If grows you. We thank God we are overcoming overcomers. We have a story to tell those who are coming after us. After all the efforts we finally started reaching the bookshops and the reception has been quite encouraging. The feedback from the earlier book Till Death also nudged us on to put in more effort. People are actually reading the books, I mean people asides our friends and family. It is just awesome. That alone is enough inspiration to write more. So far Challenge Bookshops and Dreams & Visions have given the best returns and we are grateful. It can only get better. Entangled. Wow. Virtually everyone who has read it has said they could hardly drop the book. They want more. I am looking forward to make more time to write “If I Were to Live Again”, “Mission West Africa”, “I Survived” , “The Thought Compendium” , “Alternatives: The Spouse I Never Had” and so on. Ideas are brewing and it is just a matter of time. OK. 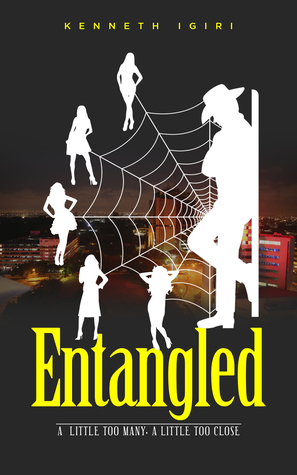 Signing out today’s scribble, I do hope to read your feedback on Amazon, Smashwords, our Facebook Page or YouTube Channel after you read Entangled. Thank you and whatever you do, express yourself! Warning: The series on this blog can be considered my private studies and are still in progress. The concept of Heaven and Earth is interpreted by some as meaning the Jewish system of worship. This appears to be corroborated by Jesus’ reference saying not one word of the law passes away except Heaven and Earth pass away. This statement would mean that it was necessary for the Temple and state of Israel to pass for the New Covenant to be in force. This apparently “preterist” view of the meaning of Heaven and Earth (passing away) is necessary for the book of Revelation to be interpreted as it is by Preterists. It also appears to align with Daniel’s prophecy concerning Jesus’ Kingdom as one that has no end and came to destroy Rome. (assuming we leave out the concept of a gap of unknown length some people call the “Times of the Gentiles”. Another fact that must be true in other for this view to align is that the book of Revelation must have been written before 70 A.D. Another interesting factor seeming to agree with this is the presence of the Kings of the earth and the “glory of the gentiles”. This would mean the New Jerusalem coming out of Heaven from God was actually the present day Church. In addition, Rev. 21:16 states the city was twelve thousand furlongs (2414.0208km) in length, breadth and height. It is the height that is scary. A lot of other scriptures refer to the expression “heaven and earth” and this direct interpretation may seem tricky for someone them though. Why is there no more sea in the New Heaven and New Earth? When I first started attending church in Ghana back in 2012, I used to buy the CD for every message preached on Sundays. Before then I already had a large collection of CDs which I carried from Lagos. I remember William Ilenikhena asked me once back at Covenant Christian Centre why I bought the message every Sunday. You know those why questions we often fail to ask ourselves, don’t you? While I did not give a ready answer to that question then, I had imagined that it was necessary to have a record of every message preached in Church even though I got the point of his question: It was more important to have the message inside one, the parts relevant to one. Recently I began to question the usefulness of every message I have ever heard from the likes of Dr. Mensah Otabil and Pastor Poju Oyemade who have been my Main Senior Pastors For the past ten years or so. I am not questioning their usefulness because the messages themselves are querstionable. They certainly are all extremely powerful contributions of these great minds/spirits. But I am asking myself what I have actually done with those useful messages. I asked myself the same question about every professor in whose class I sat back in school, about the over a hundred and fifty books in my current library and many others in my past read and unread. Every now and then in the office or other fora we find grown men arguing about what is accurate knowledge in certain fields and what is not. At the end of the day one person or the other concludes that they are right. But then what does it mean to be right? What is the value of being right? What is the value of knowledge? Is the physical, emotional and mental exertion we exercise in these discussions meaningful? Taking it a little wider, does the number of professors in a nation has translate to development? Who is responsible for the major breakthroughs of the world? Those who could talk well about what they knew? The direction of this piece is we need to ask ourselves what the value of knowledge is. How does my education translate to a better life for me and my family? For my nation? Is any additional schooling necessary? What knowledge do I really need for self-actualization in life. These questions become more relevant as we live in a society which is obsessed with paper qualifications and academic achievements. I dare say in our individual lives we need to ask again what we are doing with all this knowledge and all this schooling. Keeping them in our shelves, in our debate platforms or even in our heads just does not seem to be good enough. Whether spiritually or socially, what we know has to have a way of measurably adding to the quality of our lives and those of others around us. I have been doing a short HA/DR refresher on www.pluralsight.com and Russ Thomas said something during the module on backups that caught my attention. he said taking a backup and leaving the only copy of the backup on the same server whether backup was taken is one sure way of displaying your incompetence as a database administrator. This statement caught my attention because it made me begin thinking of all the other ways the “incompetence” of a professional with a lot of years of experience can be displayed through just one or two acts of negligence or carelessness. However, I do think that the exposure of such “incompetence” may not be because the professional is actually incompetent, it could just be because he or she is not paying attention to the little details. We all have situations where an external consultant or auditor comes into our environment and makes a twenty page PowerPoint presentation which a lot of screen shots and three quarters of the slides have pictures of gargantuan log files, almost-full file systems, and wrong parameters. The Consultant or Auditor ends up scoring a huge point on your account. I am sure this happens in other areas too: finance, security (both physical security and IT Security). it happens because the pressure of work has made a lot of us forget the basics we learnt. We know all the stuff and we can all discuss it in long meeting with a lot of finesse in our vocal prowess (was that even a correct expression?) but we simply have stopped practicing what we know. I do think some consultants would have less to do and show off with if we are a bit more careful in out apparently routine jobs. I heard a wise boss once say “You are as good as the last good thing you did” and he was right. Getting things wrongs tends to get more attention in IT and in the world than getting things right. getting things right is considered normal. You have to be either extraordinarily adept at you implementations or extraordinarily loud in promoting them for you good work to get any attention in the eyes of you managers. But just let one single file system get full and everyone will know your name! So what is the point? Well I believe since knowledge is so prolific and accessible in our day, our problem is not likely to be that we do not know what to do, we may be simply lack the motivation, courage or resources to do it. But there are some things we can do that we are yet to do and I do think in order to preserve your professional pride, you need to pay attention to those little things. Get what the standards are from the Internet and apply them, keep the routine jobs going, assess yourself before someone else does. Russ also did say it is much better for YOU to find a problem and solve it (even when everything looks fine) that for someone else to find it for you. In the past week or so I have been involved in a number of tasks that required a little bit more involving problem solving skills. Not involving because the problems were particularly difficult to solve but because there were a number of approaches to solving these problems and the issue became finding the most effective way. Have you ever come across one of those exam questions where you are asked to choose the best answer or the most appropriate answer or the answer that required the least administrative effort. That is the kind of thing I am writing about. The first case I will share is the case where we were trying to map the columns of a set of tables from one database to those of a single table in a another separate but related database. We had managed to combine a set of about thirty structurally uniform tables into one data set using the WITH and UNION ALL clauses then we ran into the challenge that all columns at source were not present at destination. The columns we were seeing at the destination were derived for the most part. We had one or two options: simply offload the problem to the vendor or re-write the application code which needed the table (involving a different vendor). Both approaches involved a third party who did not share our enthusiasm to make this work for obvious reasons. However we at least got the first vendor to give us the mappings that existed; the rest we had to get by painstakingly extracting sample rows and comparing source and destination then writing simple SQL to create derived columns. It took some time and effort and the tenacity of Joshua Adom. The second example I will share is that of a situation we observed after performing an upgrade over the weekend on an Oracle installation sitting on AIX. It so happened that the upgraded databases shared a certain server with another set of databases in the reporting environment which were yet to be upgraded. The first thought was to move the data to another reporting serve which still had the old Oracle version during the next restore cycle. Good idea but might overload the other server. The Christopher Atayero and Ugonna Udunwa nailed it simplistically – install two Oracle homes on the same server! 1. Agility. Be open to a variety of approaches. They say there are many ways to kill a cat. Some ways end up being more efficient and less expensive. Expense here refers to effort not necessarily money. 2. Skill. Expose yourself to much product knowledge. You may not be using a particular skill set just yet but one day the knowledge you have been accumulating will be demanded by a new problem. 3. Depth. Take a moment to think through an issue. The first thought is not always the best. Subject your ideas to scrutiny and keep asking whether there is a better way. 4. Collaboration. Brainstorm, review and brainstorm again. The solution to a problem should create as few new problems as possible and very low probability of re-occurrence. Having a colleague analyse the solution achieves this goal. 5. Openness. Be humble enough to accept other solutions and contribute to them even when yours simply was not good enough. Develop a Team Mentality and let your motive be to solve the problem not to show off your smartness. You are not the world’s smartest and even if you are, sometimes those you consider below you do have ideas that are above you. Abena walked briskly towards her car and Philip trailed behind, wondering why she was in such a hurry. Philip startled some passersby with the roar of his laughter. Abena wasn’t amused. Philip noticed how serious she seemed and tried to explain without giving details of what let up to their acquaintance. Philip had just dropped his luggage in the open booth. He walked to the passage side of the front seat as he made the last statement. Abena was on the driver’s side. She stopped and stared at him momentarily. The look on her face was a warning that this line of discussion was no longer safe. He changed topics. “Nice car” he complimented, shutting the door at exactly the same time as Abena started the engine. He was always proud of his upwardly mobile career lady friend. The rest of the drive was not very eventful and as soon as they reached Ablekuma, Abena declined following him in. Zainab came towards the window as soon as she heard the sound of the small red Kia Venga stopping by the gate. She didn’t see clearly but it was obvious Philip was being dropped off by a young lady. Back in the car Philip reached out to hug Abena and she obliged. This was a little rare between them. They held on for a few seconds then Abena pushed him away abruptly when she felt his lips on her neck! “What? Are you OK? Did you just kiss me? What? I can’t believe this!”. She kept shaking her head and expressing disgust with the gestures on her face. Philip was dumbfounded. Why did he do that? He had no idea! He just stared into space while Abena questioned him with her eyes. He was glad she resisted at the same time surprised that she, whom he did not think of as particularly spiritual, was the one who woke him up. Abena was raised in a staunch Catholic family and morality was very important. Virginity was a strong virtue. To Pentecostals of the twenty-first century, Speaking in Tongues was much more important than virginity. To Catholics, it was different. There was pride in keeping oneself intact till marriage. Philip experienced the reality of that conviction from Abena’s response. She knew exactly where the boundaries were. Philip promptly opened the door and stepped out. He managed to pick his luggage from the booth and came back, peeping through the glass to say goodbye. “I’m sorry” he mumbled but Abena zoomed off without responding. He pulled out the trolley handle gently and walked through the gate which had been ajar, dragging his bag and a heavy dose of depression. Something was wrong with him. He needed help. Zainab opened up the front door and beamed with a smile, bright as sunshine. Her eyes sparkled and looked straight into his. She hugged him hard and the took his travel bag from him bringing it through the door. Both were smiling sheepishly and blushing heavily. To Zainab, it felt just like welcoming her husband home. She shut the door gently and locked it while Philip looked at her shorts which she had worn specially for this moment. He spelt the mild feminine body spray. When she turned around and look at his eyes again she knew he was ready for her. She pulled him towards herself and planted her lips on his. He did not resist. The entire cycle repeated itself again and they were in bed with each other at 7:00 PM after a few hours of sleep. “We did it again!” Zainab started. WARNING: The title of this book may change before being published. Ha Ha Ha Ha. She moved towards Helen who was still standing close to Philip’s Toureg. Sandra’s heavy figure ought to have made Helen, a size eight, wary about having a face-off with her. Sandra moved towards Helen and noticed the defiance in her face. She gave a her soft push. The security men tried to hold her back. Four men struggled to hold Sandra back. it was such an interesting scene for those who loved to watch others fight. A fight was brewing here. Between two women. It was one of those awkward moments when a quarrel breaks out and someone who is smart enough realizes there is more to it that the little step on the toe that was visible to everyone. There was certainly more to this matter than the fact that Sandra had blocked Helen’s car. Even the Security Guards new. Abena was close. She had been walking briskly towards Philip’s car. She knew that car quite well. Maybe this slim lady had deliberately chose to stand by it for this face off. “Bundle her away! If not I will call the police!” Helen could not be silenced. Her eyes widened. She kept her distance but kept raising her voice, threatening and insulting the ladies, sweating profusely while at it. “Madam, what is this about? Is it just the car or something else?” Abena asked. She did not wait for an answer. “Who is your Madam? Idiot!” Helen snapped. Sizing her with disdain in her eyes. Abena heard the words faintly. she had turned her attention away towards Sandra. Abena kept quiet. She was visibly angry. Not at the slim, stylish young woman who had embarrassed them in front of Philip’s office and not at Philip himself. She was angry at herself for letting this trip to his office happen in the first place. She vowed to herself not to let it happen again. That little lady would not have had the effrontery to initiate that face off of there was nothing going on between them. Office Wife! Her phone rang. Sandra picked and put the phone in Her left cheek. “Hi Abena. Where are you?” It was Philip. “Left? What’s wrong?” He was standing by his car. Helen had long gone right behind the ladies and Philip was turning his head back and forth in the now scanty car park looking for Abena as though she would be hidden under one of the ten to twelve cars now left at the front of the brightly lit car park. “Ok..” The line was dead before he finished the two letter word. Abena was pensive. Sandra was silent. maybe this was her fault after all. how could she have know the young man was some kind of philanderer knocking women’s heads together. The way Abena spoke about him it was as if she had him all to herself. but no one had Philip. Philip had himself and managed to give those he cared about their portion of his time. the time allocated to each lady was good enough to satisfy them and position them as very dear to him. Perception is everything. It was in no way deliberate. he was not really trying to knock heads together. he was not trying to have all the ladies. One could even claim they were trying to have him. he was just being nice and he did care about each princess in his ‘harem’ . He just did not consider any of them his girlfriend or anything close to that. Girlfriend? No! not even Zainab. Helen was still on the road when Philip called. She picked the call using her bluetooth device. “Hi Philip. Surprise, surprise. I thought we were not talking to each other!” She sounded in high spirits though she did not smile. they say one can tell if you are smiling over the phone. The excitement in her voice could not have given away her near-death experience a few minutes previously. Philip hesitated now wondering if she was actually the one Abena had encountered. He had assumed it was her since she had called early claiming his bank girlfriends were looking for him. Should he ask this question and how should ask it safely. She hadn’t been on talking terms with Helen for weeks. If he had assumed wrong then this would probably extend the malice another few months. Helen paused. Then spoke again, with a little less excitement. “What did they tell you? That I fought with them? They blocked my car and I simply asked them to move. Why should they block my car? …” The excitement was back … in the other direction. It seemed only like yesterday when I stood in the theartre and watched the umbilical cord being removed from a Caucasian-looking tiny boy who happened to be my son. He seemed to delicate that it was scary to even touch him. A few months down the line his complexion has changed to a smooth chocolate or so. His eyes are bright and wide, gazing at everything curiously, he makes weird sounds every now and then speaking baby language which consists largely of crying and sobbing when he wants attention. About a month ago he started smiling for the first time. It felt awesome and we kept doing things to try to make him smile because no matter how many times he smiled every occurrence was an absolutely sublime encounter. Thrilling. We wanted to make him mile and laugh all the time. Well we call it laughter because it carried the same level of excitement as a normal laughter when we look at his face even though he hasn’t started making those cracking sound we make as adults. It makes one wonder though: what makes us laugh? What makes us cry? What the actual constitution of our emotions? Why do our emotions seem to be something we need to control as we grow for example? In a few years my boy would no longer cry when he is hungry, he would speak. When he is a teenager, a simple stare from my eyes would no longer make him smile excitedly being all grown up. He carefree baby songs would be all gone. Oh, but the wonder of those simple moments of baby life. Nothing matches them! Treasure those moments with family while you have them. They are moments that are difficult to repeat. Some of those moments may seem to have absolutely no logically expressible meaning but they are of infinite value in our human relationships. Nurture them and treasure them. The smile, the laughter, the sing along songs, the cuddle, the game of cards where the winner doesn’t matter and seeks no prize. Treasure the moments.